Individual content items, e.g. files, journal entries, and notes, can be reported as objectionable as can entire pages. Then click the item Report objectionable material. A modal window appears on the page. Complaint: In the text field, provide information why you think the content is objectionable and should be removed or changed. Click the Notify administrator button to send a notification to the administrators for review. The site administrator and the institution administrator of the institution, in which the user is a member whose content was reported as objectionable, receive the objectionable material notification. 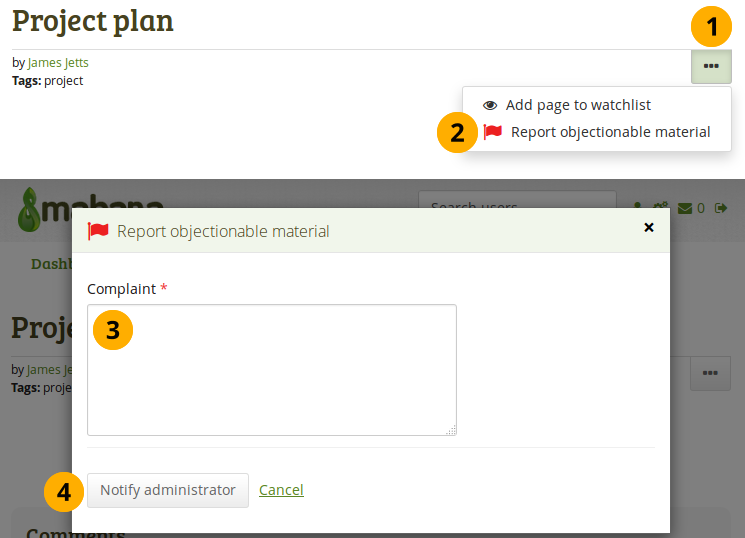 You must confirm that you want to report content as objectionable in the modal window to prevent accidental reports. If you are an administrator who receives a notification about objectionable material, you can click a link in the notification and are taken to the page or the artefact in question directly. You can view notifications in your Mahara inbox or via email. The inbox notification contains vital information about the objectionable material. The name of the person who reported the objectionable material. It is linked to the user’s profile page in case you have clarification questions. More…: A link to the page or artefact in the page that was marked as objectionable. The email notification that you receive contains important information. Complaint relates to: A link to the page or artefact in the page that was marked as objectionable. Reported by: A link to the user’s profile page who reported the objectionable material in case you have clarification questions. Once you received the notification, you can go to the item in question. As administrator you can then click the Not objectionable button if the content is in line with the terms and conditions of the site. Alternatively, you can contact the user to discuss the content and further actions. When you click the Not objectionable button, every administrator who got the initial objectional material notification receives a notification mentioning that you dealt with the complaint. Normally, as administrator you do not have immediate access to a user’s content. However, since you need to view the content to evaluate it, you have access to it without needing to log in as the user or request access permissions. Once content is marked as not being objectionable, you do not have access to it anymore.